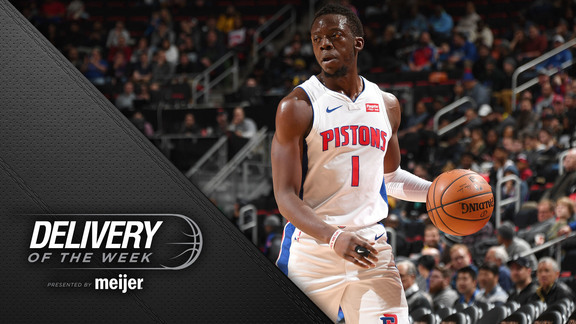 Reggie Jackson continued his recent surge with 20 points and six assists as the Pistons rolled to their third straight win. DETROIT – You know things are going well for the Pistons when Blake Griffin doesn’t have to get off the bench in the fourth quarter. Two straight home games, that’s been the case. In their first game since dealing away Reggie Bullock and Stanley Johnson in separate deals, Dwane Casey was a mad scientist, using 12 players in the first half, including newcomers Thon Maker and Svi Mykhailiuk. It didn’t look like they were going to reappear after halftime as Casey tightened the rotation to a more manageable 10. But after the Pistons pulled away from a tie at 82-all late in the third quarter to lead by 23 with three minutes left, Maker and Mykhailiuk finished off the rout. Andre Drummond was the game’s dominant force, recording his ninth 20-20 game of the season with a season-high 29 points – it had been 27, what he scored in the last home game, Monday’s win over Denver – and 20 rebounds plus three blocked shots. Over Drummond’s 33 minutes, the Pistons were a staggering 39 points better than the Knicks. “He was a monster – defending the rim, rebounding, loose balls, finishing down low,” Griffin said. Drummond, Griffin and Reggie Jackson got the Pistons off and running as they built a 16-point lead in the game’s first five minutes, scoring the first 30 points. The Pistons scored a season-high 41 points in the first quarter and led by 21 early in the second. But with Casey mixing and matching with a new cast, the Knicks – led by recent trade acquisition Dennis Smith Jr., who finished with 31 but only one fourth-quarter point – chewed into the lead, pulling within nine by halftime. With Bullock gone, Langston Galloway replaced him in the starting lineup. Rookie Khyri Thomas was next in line, coming off the bench for five points in 20 minutes. Thomas’ biggest contribution was his fourth-quarter defense on Smith, though the fact Smith missed 5 of 6 free throws in the quarter helped the Pistons pull away. Casey used a combination of Maker and Glenn Robinson III in Johnson’s old role behind Griffin with the second unit and that could continue as a platoon – Maker getting the call against power forwards with size, Robinson when teams go smaller. Mykhailiuk was as advertised, putting the ball on the floor to create a few scoring chances and knocking down a corner three. Without Bullock, their best 3-point shooter, the Pistons fared as well as they could have hoped, hitting 13 of 30 shots. Jackson continued his strong recent surge, hitting 4 of 5 from the arc and finishing with 20 points, six assists and a single turnover. Over his last eight games, Jackson is averaging 19.1 points and 6.3 assists against 0.9 turnovers while shooting .487 overall and .444 from the 3-point arc. The third straight win – the first streak of that length since the Pistons won five straight in November and December – keeps the Pistons on a path to possibly break through, as well.